Kyle and Jun raised a serious question against the way researchers have specified leisure constraints measurement model: Leisure constraints measures should be formatively measured, while the dominant model has been reflective. Despite their important theoretical contributions, Kyle and Jun’s empirical evidence has limitations. The purpose of this paper is to directly examine their hypothesis by using a statistical method called confirmatory tetrad analysis in partial least squares. In Study 1, we tested nine leisure-time physical activity constraints sub-models with online survey data collected from 296 Canadians and 307 Japanese. Our results rejected the reflective model in six to seven out of the nine sub-categories. 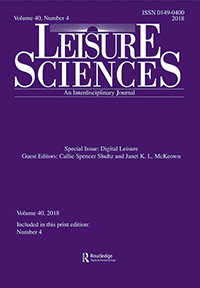 In Study 2, we re-analyzed Loucks-Atkinson and Mannell’s (2007) data, where the traditional three categories of leisure constraints were measured. Results again rejected the reflective model in two categories. Our results provide mixed, yet more direct evidence for Kyle and Jun’s argument.